A brainstem arteriovenous malformation (AVM) as an AVM in which some part of the lesion is located within the brainstem. Brain stem AVMs represent only 2%–6% of all cerebral AVMs, however, they pose a great management challenge.,, These lesions are no longer cryptic. Prompt diagnosis and anatomic evaluation of patients with brainstem hemorrhages resulting from AVMs have been greatly facilitated by high-resolution computed tomography (CT) scanning and particularly magnetic resonance image (MRI) scanning., However, all these facilities may not be available at all centers particularly in developing countries and can pose a difficult challenges and limitations to the neurosurgeons in diagnosing and managing these patients as in the present case. This 12 years child presented with weakness of the left half of the body for the last 16 days, deviation of angle of mouth to right side with a history of difficulty in speaking and drooling of saliva. There was no history of a headache, fever, cough, or bowel/bladder disturbances. On examination, his higher mental functions were normal. He had pyramidal type of weakness in the left upper and lower limb. He had left upper motor neuron facial nerve palsy. Extraocular movements were full. He had bilateral nystagmus. He was not able to walk without support. He also had right cerebellar signs. With all these findings, possibility of the brain stem mass lesion was considered. His CT scan plain and contrast showed isodense lesion involving midbrain and extending into the, right superior cerebellar peduncle and right cerebellar hemisphere and enhancing well with contrast. 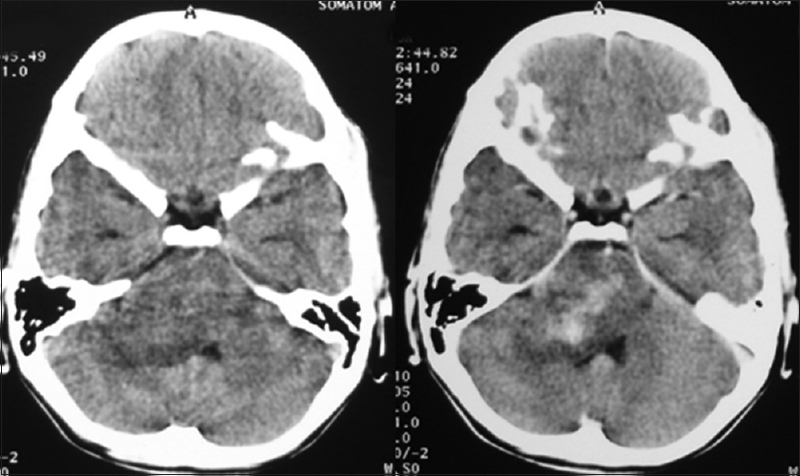 There was associated perilesional edema but no hydrocephalus [Figure 1], [Figure 2], [Figure 3]. 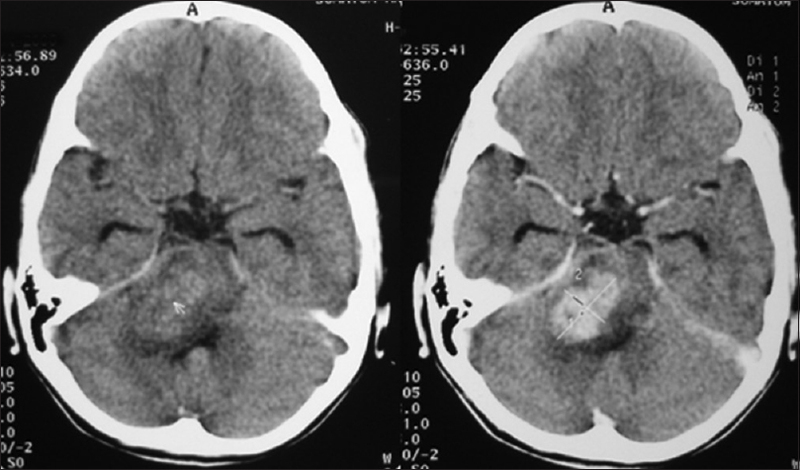 A possibility of glioma versus tuberculoma was considered. At our center, we do not have facility of MRI or angiogram. In addition, the patient could not be referred to another center because of financial constraints. To confirm the diagnosis, he underwent right retromastoid suboccipital craniectomy and microscopic decompression of the lesion. 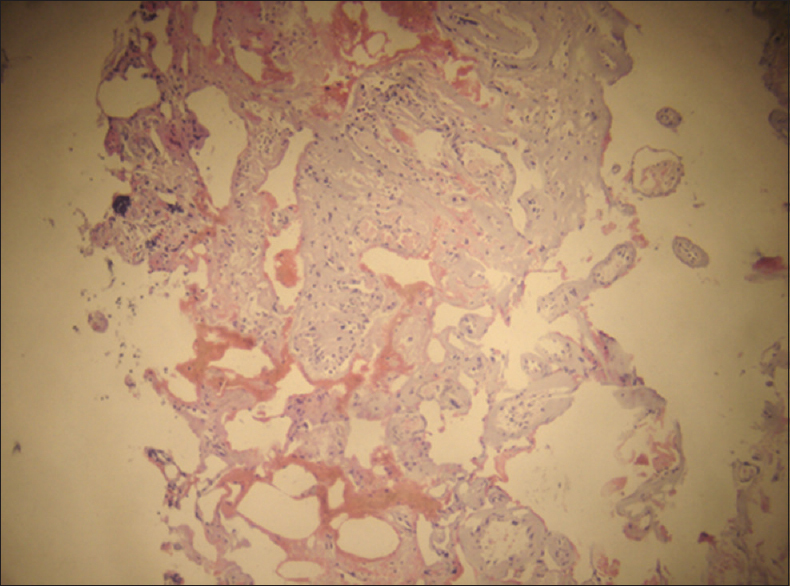 The lesion was moderately vascular, grayish with ill-defined plane of cleavage. After partial decompression, it was felt that it is not safe to decompression the lesion which was extending into the midbrain. Postoperatively, the child recovered well without any new deficits. 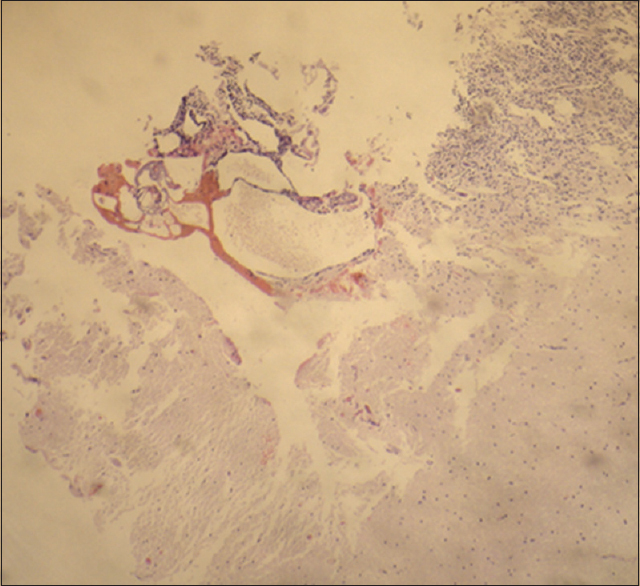 To our surprise, histopathology of the specimen showed AVM with normal brain parenchyma [Figure 4] and [Figure 5]. Clinically manifest AVMs in children are rare, and few pediatric series have been reported., In children, the most common initial symptom of AVM is hemorrhagic stroke with high mortality and morbidity rates., Infratentorial AVM location is independently associated with higher frequencies of AVM rupture and hemorrhagic AVM presentation. About 80%–90% of patients initially presented with an intracranial hemorrhage,, and the risk of hemorrhage in untreated patients is estimated to be 60% in 10 years. Like any mass lesion, the most frequent symptoms of brain stem AVMs are eye movement disturbances, followed by cerebellar, and pyramidal signs. At the time of presentation, most patients of these patients are ambulatory with good Karnofsky Performance Status and cannot be differentiated clinical with any other brain stem lesion as in the present case. MR angiography is a new noninvasive angiographic technique which is very useful for screening and follow-up of AVM in the brain. Axial MR angiography can also distinguish perforating arteries from the main trunk or nidus which may overlap on conventional angiography.,, MRI has renewed interest in the treatment of this disorder because of the precise accuracy in diagnosis and localization of these lesions that it affords. The MR image demonstrates the characteristic findings of multiple hemorrhages of varying ages surrounded by a hypointense peripheral zone of hemosiderin. The vascular malformations could be demonstrated as “flow void” areas. At our center, all these facilities are not available, and for the patient, finances were the major limitations. In the present case based on CT scan findings, we did not consider the possibility of brain stem AVM and after histopathology only the diagnosis of brain stem AVM could be made. From the management point of view, there is no solid consensus on the optimal treatment protocols for these lesions at present. The goal of any treatment is complete occlusion of the malformation with minimal risk to the patient, primarily to prevent rebleeding and further neurologic injury from the AVM. Utilizing modern microsurgical techniques, surgical resection can be applied with considerable, but acceptable, morbidity and mortality in some groups of the brainstem, AVMs with hemorrhagic presentation, particularly dorsal midbrain and cerebellopontine angle types, in which most parts of the nidus located sub- or extrapially. Endovascular management of a brain-stem AVM may be an alternative to treatment such as radiosurgery and microsurgery in selected cases. It may be not as risky as previously thought. Embolization can reduce the size of the AVM and possibly make it more treatable by radiosurgery and decrease the possibility of radiation injury., This case illustrates in the absence of bleed it is difficult to make a pre-operative diagnosis of arteriovenous particularly when lesion looks like a solid tumor on the CT scan, and there are limited facility to investigate the patient. Nozaki K, Hashimoto N, Kikuta K, Takagi Y, Kikuchi H. Surgical applications to arteriovenous malformations involving the brainstem. Neurosurgery 2006;58:270-8. Solomon RA, Stein BM. Management of arteriovenous malformations of the brain stem. J Neurosurg 1986;64:857-64. Batjer H, Samson D. Arteriovenous malformations of the posterior fossa. Clinical presentation, diagnostic evaluation, and surgical treatment. J Neurosurg 1986;64:849-56. Perret G, Nishioka H. Report on the cooperative study of intracranial aneurysms and subarachnoid hemorrhage. Section VI. Arteriovenous malformations. An analysis of 545 cases of cranio-cerebral arteriovenous malformations and fistulae reported to the cooperative study. J Neurosurg 1966;25:467-90. Sisti MB, Stein BM. Arteriovenous malformations of the brain stem. Neurosurg Clin N Am 1993;4:497-505. Kashiwagi S, van Loveren HR, Tew JM Jr., Wiot JG, Weil SM, Lukin RA, et al. Diagnosis and treatment of vascular brain-stem malformations. J Neurosurg 1990;72:27-34. Harwood-Nash DC, Fitz CR. Neuroradiology in Infancy and Childhood. Vol. 3. St. Louis: Mosby; 1976. p. 902-64. Raimond AJ. Pediatric Neuroradiology. Philadelphia: Saunders; 1972. p. 642-54. Fults D, Kelly DL Jr. Natural history of arteriovenous malformations of the brain: A clinical study. Neurosurgery 1984;15:658-62. Griffiths PD, Blaser S, Armstrong D, Chuang S, Humphreys RP, Harwood-Nash D, et al. 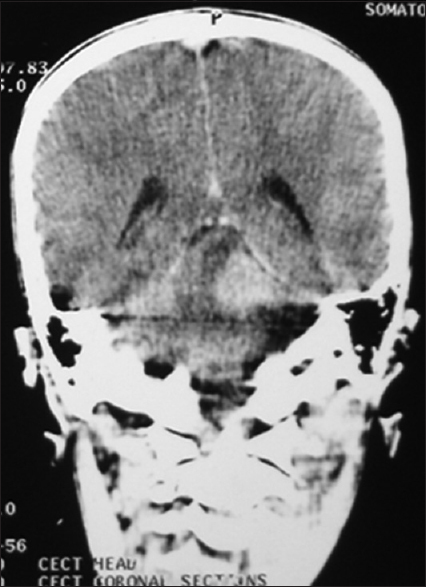 Cerebellar arteriovenous malformations in children. Neuroradiology 1998;40:324-31. Khaw AV, Mohr JP, Sciacca RR, Schumacher HC, Hartmann A, Pile-Spellman J, et al. Association of infratentorial brain arteriovenous malformations with hemorrhage at initial presentation. Stroke 2004;35:660-3. Ochiai C. Natural history of brain stem vascular malformations: Clinical features, bleeding properties and surgical indications. Neurosurgeons 1991;10:207-29. Kurita H, Kawamoto S, Sasaki T, Shin M, Tago M, Terahara A, et al. Results of radiosurgery for brain stem arteriovenous malformations. J Neurol Neurosurg Psychiatry 2000;68:563-70. Chakeres DW, Schmalbrock P, Brogan M, Yuan C, Cohen C: Normal venous anatomy of the brain: Demonstration with gadopentetate dimeglumine in enhanced 3-D MR angiography. AJNR 1990;11:1107-18. Huston J 3rd, Rufenacht DA, Ehman RL, Wiebers DO. Intracranial aneurysms and vascular malformations: Comparison of time-of-flight and phase-contrast MR angiography. Radiology 1991;181:721-30. Nüssel F, Wegmüller H, Huber P. Comparison of magnetic resonance angiography, magnetic resonance imaging and conventional angiography in cerebral arteriovenous malformation. Neuroradiology 1991;33:56-61. Samson D, Steiner L, Stein BM, Debrun G. What is your general approach to the management of brain stem AVMs? Surg Neurol 1995;44:107-8. Liu HM, Wang YH, Chen YF, Tu YK, Huang KM. Endovascular treatment of brain-stem arteriovenous malformations: Safety and efficacy. Neuroradiology 2003;45:644-9.